Thanks for signing up! We'll Email you more info about the Bolt DSMC2 as it becomes available. From DITs to 1st ACs, filmmakers around the world rely on Bolt’s flawless image quality and wireless performance to capture incredible imagery. The Sidekick XT is our top of the line universal 500 ft. receiver compatible with all versions of our Bolt 500, 1000, 3000, XT and LT models. 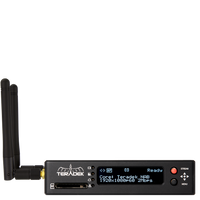 With dual SDI outputs, 3D LUT support, and a built-in 5 GHz Spectrum Analyzer, the Sidekick XT is our most powerful universal receiver yet. * 20MHz channels cannot utilize interlaced, PSF, or 1080p60/50 at this time. ** Based on USA channels. Channel availability may vary by region. Every Bolt model is capable of transmitting to 4 receivers of the same range (or Sidekick II) simultaneously, ensuring your clients, director, producer, and others can view the feed wherever they are on set. Bolt 1000 XT and 3000 XT systems allow you to manually select your 5GHz channel on the fly to avoid interference or abide by local wireless laws. For extremely challenging RF situations, the Bolt XT 3000 can be set to operate over 20MHz to improve wireless performance. Our built-in encryption ensures your video footage is impossible to intercept, even if somebody tries to pair an unauthorized Bolt receiver to your system. Transmitting audio and video isn’t all that Bolt can do. Auxiliary data can be sent with each video feed and users can upload and apply custom 3D LUTs to their receiver’s output. Bolt XT models support extended metadata from certain camera manufacturers. Apply the look you’re after directly to your wireless video feed using Bolt’s integrated 3D LUT technology. * Upload your own LUTs using the free Bolt Manager software or select from a number of built-in presets using Bolt’s OSD. Take your wireless system to the next level with mounting, power, and antenna accessories. For quick configuration and firmware updates, the Bolt Manager software and hardware solutions ensure you’ll be up and running with optimal performance in no time. Configure your Bolt system quickly with Bolt Manager. Perfect for rental houses, the Bolt Manager hardware box helps you rapidly pair multiple receivers, change wireless channels, and configure regional settings on set without a computer. Several power solutions are available for Bolt, including Lemo to PTap cables, battery mounting plates, AC adapters, and more. Bolt features several ¼”-20 holes for mounting on both the transmitter and receiver. For additional options, separate mounting plates, ultra arms, and Wooden Camera Director’s Monitor kits are available.